Like any other company, each one has its own vision, mission, values, and principles, and set of goals. Given this, it’s crucial for business owners to know how to lead their employees for them to develop their potential holistically. Leaders in a company are essential because they are usually the supervisors of most operations inside the business. With this, it’s important to know how to effectively lead your team to make all actions synchronized, dynamic, and efficient. There are different kinds of leadership that most business team leaders use to manage their employees. Some are too democratic, and some can be dictatorial, some are servant types, while some practice coaching. It may be true that certain businesses may require a particular leadership style. But, leaders must also take into consideration the growth and development of their team members. When I first started, I leaned towards a dictatorship kind of leadership. With this, I struggled in being the main contributor to ideas and solutions whenever something happened involving the business. It was exhausting in a way because I was thinking of solutions, and everything heavily relied on me. The cycle would be me coming up with a plan, and my team executing the plan without any contentions or such. In the course of our business’ mediocre progress, I realized this kind of leadership was wrong. Dictatorship creates a sort of dependency among the team members to the leader. This makes the team do tasks without questioning whether it is right or wrong, or if it is efficient or not. The team members tend not to use their thinking capacities, and they end up just executing plans instead of doing their passions and using the best of their abilities. At the same time, on my part, it creates an even bigger challenge because my team always needed me. It limits the company’s potential to grow. Given the lack of involvement of team members because of the dictatorial leadership I once used, I decided to change the process of how I handle my workers. I resorted to a coaching style of leadership in which I motivate my members to be more involved so that their talents and abilities. With this, they can achieve their utmost potential. They can also grow and expand their horizons to help them achieve more in their career. Ever since I started using this question, it has drastically changed the work ethic of my team members, affecting the company’s growth in a positive way. By asking this question, it facilitates the creative thinking of the brain, making way for solutions and better problem-solving skills. In addition, once the members hear from each other, it creates a pool full of ideas and suggestions. This makes problem-solving much more efficient and convenient. Another powerful point with this kind of coaching is when the team members are the ones who come up with their solution or proposal. They are more passionate and driven to execute the proposal since it came from them. If you compare the results, you could easily see they work better. Learning how to involve your team members will instill self-worth in each of them. They will also have the opportunity to grow the culture of the company. In addition, the will have the opportunity to improve processes of how everything is done. It creates a better relationship among the members and team leaders. By having a more involved team, doing work will feel like less of a responsibility or requirement. Working in this kind of style opened a lot of doors for my team members and the business itself. Thanks to the coaching style of leadership. Team members are now better at enabling themselves to think and come up with ideas. These ideas can be far off better than those team leaders could even think of. I was practically hitting three birds with one stone - the business developed, I gained better leadership skills, and the members improved their work ethics and capabilities as individuals, making everything beneficial in general. There may be times you might not agree with the ideas and suggestions your team members would come up. It’s not entirely wrong to intervene at times. Through this kind of guidance, you are not taking full responsibility of the solution, but you are simply facilitating your team members into seeing things in another perspective to develop better and more feasible ideas which would be more beneficial to your company. Coaching is a great way to lead a company because it specially hones your members. You do not dictate ideas to them, but instead, help them produce better outputs. By being a mentor, you also help your team members become future leaders. You invite them to improve their thinking capacities and problem-solving abilities. As a result, everyone is involved, business is moving forward, and everything may turn out well for your company. So now, I challenge you. Instead of dictating this and that, why not ask ‘how’ questions that could lead to great ideas. It’s time to focus on developing the real assets for your company - its members. 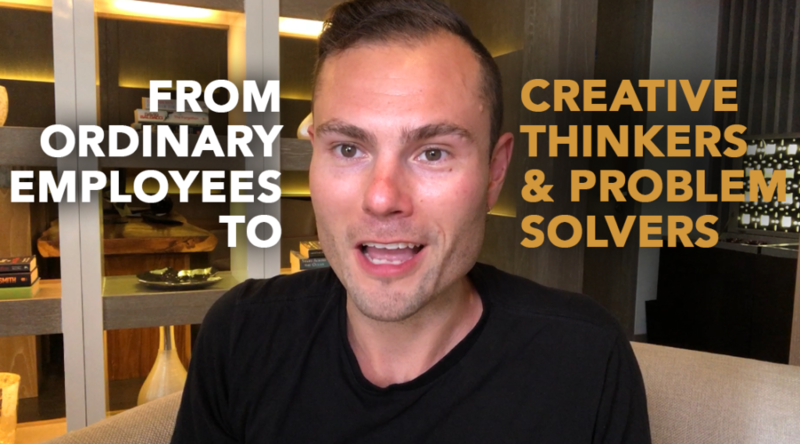 Invest more in learning how to turn your ordinary employees to creative thinkers and problem-solvers today.